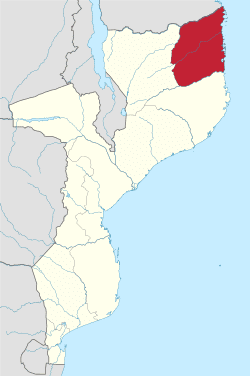 Cabo Delgado is the northernmost province of Mozambique. It has an area of 77,867 km² and a population of 1,893,156 (2015). As well as bordering the neighboring country of Tanzania, it borders the provinces of Nampula and Niassa. The region is an ethnic stronghold of the Makonde tribe. Macua and Mwani ethnic groups are also present. 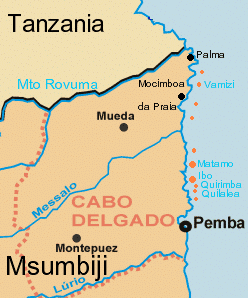 Pemba is the capital of the province; other important cities include Montepuez and Mocimboa da Praia. On 25 September 1964, Frelimo guerrillas arrived from Tanzania, with help from some individuals of the surrounding population, attacking a Portuguese administrative post in the province. This raid marked the beginning of the Portuguese Colonial War, the armed struggle between the Portuguese colonial authorities in the then Portuguese Overseas Province of Mozambique. This province was the focus of Operation Gordian Knot, where the Portuguese colonials attempted to wipe out the guerrilla bases in the province. The province is named after Cape Delgado (Portuguese: Cabo Delgado), a coastal headland on the border between Mozambique and Tanzania, which forms the northernmost point in Mozambique. Pemba - covering 194 km² with 141,316 inhabitants.